This past week Winter finally arrived with a vengeance…we’ve been treated to a very mild Autumn so far, with well below the average rainfall and very moderate temperatures, but we were advised to brace ourselves for a storm with “cyclone-strength winds” which, it turns out, gusted up to 170km/hr along the peninsula where we live. And believe me when I tell you I was very, very nervous. Thankfully it arrived overnight and lasted about 8 – 10 hours, so we were all safely at home and together. I have renewed faith in our little wooden home. We were woken around 1.30am, and I honestly wondered whether the roof was going to lift off or whether the windows might last the night. The house shook and rattled, but it remained sturdy. The trees seemed to be doing an hysterical dance and it was hard to believe that they remained rooted, although as dawn broke, it was obvious that small branches and other minor debris littered our garden. One of our beautiful native palm trees is leaning slightly onto a fence so we’re hoping that we won’t lose it, but Hubby is planning a full-scale inspection this weekend. The nice thing about such stormy weather, though, is the feeling of genuine fear that one begins to feel, and, in turn, how absolutely miniscule we are and how some of our daily troubles are put into perspective. A good bout of Humility occasionally is very good medicine for the soul. And a few hours without electricity isn’t actually the end of the world. It was fun making our lunches the following morning by candle light, definitely something I haven’t tried before. But as the hours stretched to almost two days without hot water, it began to ruffle feathers and we realise how easily we miss our first world comforts. Thankfully, though, we had a stash of chocolate cookies I’d baked a few days earlier to keep us company. The idea came to me while at my son’s swimming lessons. I had promised him a Gingerbread Man from the café on our way out, as obviously one has to walk past a strategically placed café with all sorts of yummy treats to catch the attention of littlies hungry after swimming lessons. I’m one of those Mums who prefers to pack a snack from home, with home baked treats, fresh fruit and perhaps a few crackers or cheese, but as I’d been harranged for weeks by one particular gorgeous little person, I finally caved and promised him a gingerbread man. On this particular day, however, on arriving at the counter, they were all out of gingerbread men. Seems my little man wasn’t the only one with that idea. So his next choice was a chocolate cookie with M&Ms placed on top. It was oversized, as most of these purchased cookies are and as I muttered away about how a single cookie could cost $3, I convinced him it was big enough, and expensive enough, for us to share it. I really just wanted to sink my teeth into it as it looked delicious! And I wasn’t disappointed. As soon as we arrived home, I began planning and plotting my own version – eventually settling on the Edmonds recipe. Turns out it is a fairly simple chocolate cookie, as these taste almost the same, except probably not as sweet. And as a friend jokingly noted, it’s probably all the preservatives and E numbers added to the professionally made ones that makes the difference. But I’m quite prepared to sacrifice a little of whatever it is they add in the interests of a home baked version which contains lots of Motherly Love and Kisses. My son actually asks me if I add kisses to the food when I make it with love – awwww! Of course – don’t most Moms? Anyway, easy peasy and all that so give them a try. 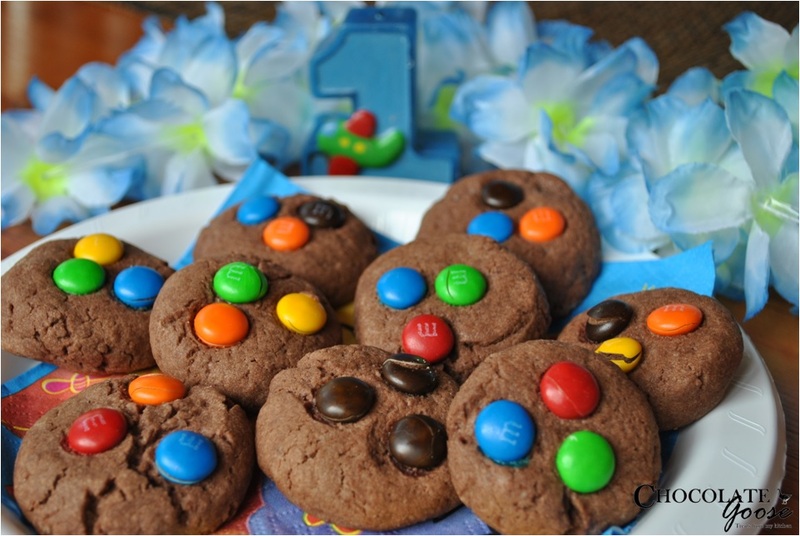 Any lollies can be added on top, but I lurrrvveee M&Ms and these cookies carry on the festiveness of June being Chocolate Goose’s first birthday anniversary. Preheat the oven to 190°C and line an oven tray with baking paper. Cream the butter, sugar and vanilla together until light and fluffy. Add the egg, beating well to combine. Sift the baking powder, cocoa and flour together and add to the creamed mixture. Using your hands, roll handfuls of the mixture into balls and flatten on the prepared oven tray. Press a few M&Ms into each cookie and bake in the oven for about 12 minutes. The recipe says you should get about 35, but I made them a little larger than normal, so about 30 is realistic.